This beautiful traditional Peranakan cake is popular around Chinese New Year. It is very labor intensive and requires standing in front of the oven for two hours as you add each layer of batter. It also uses 27 (!!) egg yolks. So freeze those extra egg whites for some future Angel Food cakes! Preheat oven to 380ºF (195ºC). Line an 8x8” square cake tin with parchment paper and dust with flour. In a large bowl, cream cold butter and half of the icing sugar until mixture is light and fluffy and butter is not yet melted. Set aside. With an electric mixer, beat egg whites with remaining icing sugar to stiff peaks. Add egg yolks one at a time and continue mixing until mixture is light and creamy. Add brandy and condensed milk. Mix well. Turn mixer to lowest speed and add creamed butter mixture. Sift all-purpose flour and spices together in a separate bowl. Add flour mixture to egg mixture and fold by hand. To build cake layers, spread 3 spoonfuls of batter evenly in prepared cake tin. Bake for 3-5 minutes or until cake layer is golden brown. Remove from oven, prick cake gently with a toothpick to check for bubbles and remove any excess air. 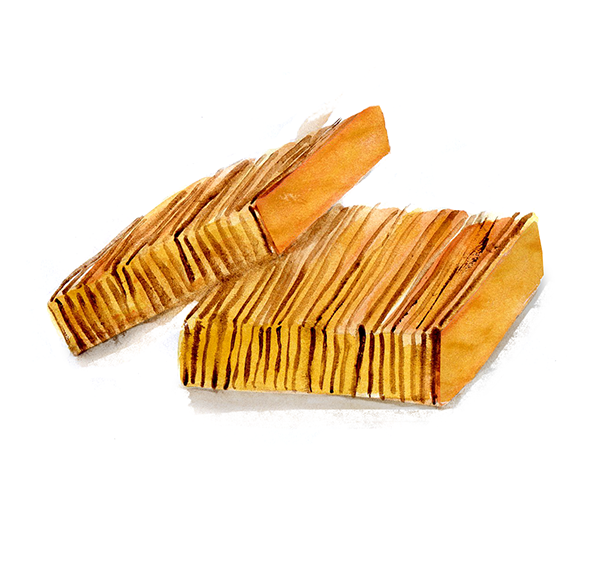 Press baked layer flat with parchment paper or a lapis press. Turn oven to broil mode. Add 3 spoonfuls of batter on top of the previous layer and spread evenly. Place in oven for 3 minutes or until layer turns golden brown. Prick with toothpick to remove air bubbles and press layer flat. Continue this process until all batter is used up. The key to achieving the beautiful layers is to make sure each layer sufficiently browns at the top before adding more batter. Pressing down on the cake layers before adding more batter will keep air bubbles from forming between layers. Some recipes recommend brushing each layer with melted butter after baking to keep the cake moist. After the last layer has been baked, insert a toothpick in the center. It should come out slightly buttery but clean. Bake for a few minutes longer if necessary. Remove from oven and brush cake with brandy while still warm. Let cool on a wire rack. To serve, trim edges and cut into thin slices. Cake can be refrigerated for 1 month, but wrap well to keep it from drying out.